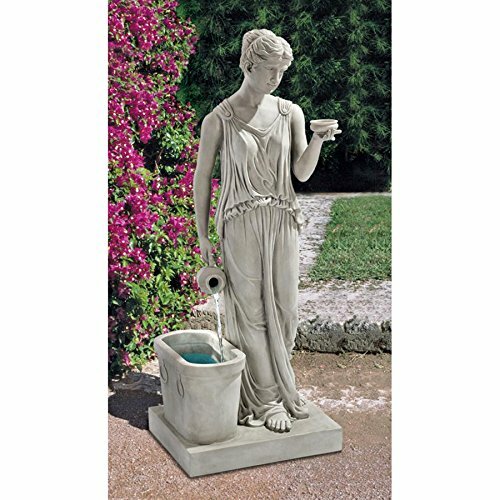 Water Fountain - 3 Foot Tall Hebe Goddess of Youth Garden Decor Fountain - Outdoor Water Feature | Fountain City Art Ctr. KY2079 Features: -Cast in quality designer resin.-UL listed pump.-Indoor/outdoor pump. Color/Finish: -Hand finished. Assembly Instructions: -Assembly required. FOUNTAIN OF YOUTH - Personifying the eternal beauty of youth, the goddess Hebe, cup bearer to the Olympic gods in Greek mythology, becomes a outdoor fountain as her sparkling waters cascade from cruet urn to waiting basin. MAKE AN IMPACT! - Standing over three feet tall, this large fountain will be the focal point of your outdoor decor as garden decorations, patio outdoor fountain display or the center of attention on your front lawn..
DESIGN TOSCANO WATER FEATURE - Exclusive to the Design Toscano brand, this self contained, freestanding waterfall garden fountain will be the focal point of your patio, lawn or outdoor garden decor. OUTDOOR WATER FOUNTAIN - Our perfectly sized water fountain for your lawn, patio or outdoor decor measures 14"Wx12"Dx37½"H. 31 lbs. This fountain includes a 95 GPH (gallon per hour) fountain pump. Bronze Statue Single Dolphin On Wave Fountain Size: 48" L x 24" W x 53" H.
Bronze Statue Dolphin Fountain On A Marble Base Size: 12" L x 8" W x 30" H.